Qmani Management and its team. Qmani enterprise and mobile data solutions are deployed for Business SMS applications and interfaces to government, corporate, university, SME, solution provider and service provider clients. Its flagship product, Qmani smsQ provides a full-featured Internet browser-based application for sending SMS from PC to one or many mobile phones. smsQ integrates with Qmani's powerful in-house developed gateway platform to deliver a seamless solution for varied applications. Qmani's products are web-based and hosted in a secure datacenter environment, and the user need only have access to the Internet from anywhere in the world to be able to use Qmani solutions. For solution and service providers that are building SMS capabilities into their business software solutions, the Qmani automated interfaces will enable their software solutions to be deployed in the most effective and quickest manner. Qmani owns, operates and develops its products. 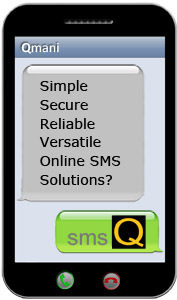 It employs Australian technology and expertise to provide businesses with innovative SMS based messaging solutions. Qmani provides SMS traffic using direct Australian carrier-grade SMS to ensure reliability and high capacity of sending and receiving of Business SMS to 100% of Australian mobiles. Our powerful and yet simple value proposition for its clients is to improve business performance and reduce communication costs. This is particularly significant when SMS is integrated into business workflows, support systems and customer loyalty and promotional programs.